Earlier this year, we wrote about constitutional lawyer Marvin Ammori's excellent book On Internet Freedom, which highlights a variety of different battles concerning internet freedom -- many of which we talk about here every day. If you really want to understand what's happening in the battle both for and against internet freedom, you should read this book. Given that, I'm thrilled to announce that we've now added the ebook (in a variety of ebook formats) to the Techdirt Insider Shop, where it's available on a donate what you want basis. All proceeds from the sale of On Internet Freedom will be split between two groups that are doing important work on (you guessed it) internet freedom: Demand Progress and Fight for the Future. If you haven't already read Marvin's fantastic book, you really ought to pick it up -- and while you're in the Insider Shop, feel free to take a look at our other ebooks, gear and apparel and some cool blog perks you can get by becoming a Techdirt Insider. Thanks for checking it out. 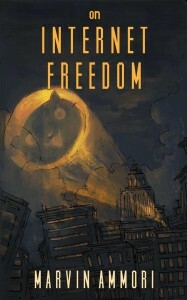 Every time I see that cat signal I have a laugh.